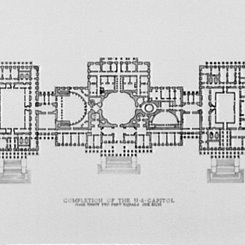 Image courtesy of Library of Congress The 1959 East Front extension completed the nearly century-old architectural plans of Thomas Walter. Walter served as Architect of the Capitol from 1851–1865. On this date, President Dwight D. Eisenhower laid the cornerstone for the long-planned East Front extension of the U.S. Capitol. The event also marked the 108th anniversary of the cornerstone laid by President Millard Fillmore for the 1850s expansion. More than 3,000 people descended on the Capitol for the ceremony at the construction site. Under the new 49-star U.S. flag (Alaska had joined the Union as a state in January 1959; Hawaii would join later that August), Eisenhower reminded attendees that the event marked the anniversary of the signing of the Declaration of Independence and discussed the past cornerstone events. “As we now lay this new cornerstone in the United States Capitol, we are grateful for the courageous beginnings of a new nation, represented by the first stone,” Eisenhower said, “for the pioneering effort and the bountiful growth represented by the second; and for the confidence, if we make ourselves worthy, that this third stone will forever symbolize America's unending purpose, under God, to lead along the path toward peace, with justice for all peoples.” After his remarks the President, using the same trowel President George Washington had used to lay the original Capitol cornerstone in 1793, spreading cement on a slab of concrete before the stone was put into place. The extension project was supported by Speaker of the House Sam Rayburn of Texas who deemed the construction necessary for building aesthetics, office space, and safety. Completed in 1962, the East Front extension holds committee rooms, meeting space, and offices.